One of the most important factors in maintaining CPAP compliance is taking proper care of your CPAP equipment. 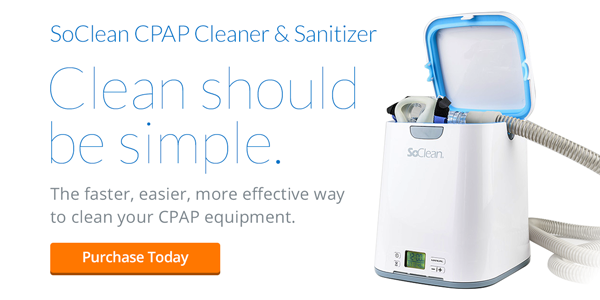 In order to have successful CPAP therapy, you must be willing to make your treatment a priority in your life, and that means regularly cleaning and maintaining your CPAP equipment. Fortunately, taking proper care of your equipment is pretty easy, and not very time consuming. With a little adjustment to your regular morning routine, your device and accessories will be working at 100% efficiency to get you that much needed sleep you've been longing for. At The Alaska Sleep Clinic we care about how well our patients' therapy is progressing, and we strive to provide as much information as possible to make sure that they are highly informed on the impact that therapy compliance can have on their lives. One of the most frequent questions we get asked is "how often do I need to clean my CPAP equipment?" To answer this question we set out to compose a comprehensive guide on proper CPAP equipment maintenance and cleaning. Remove chamber from humidifier carefully so water doesn't enter your CPAP machine. Open chamber and wash with warm, soapy water. Rinse well with water and allow to dry on a clean cloth or paper towel out of direct sunlight. Fill with distilled or sterile water. Do not use tap water as it may contain minerals and chemicals that can damage components of the machine. It is also not recommended to use filtered water (i.e. through a Brita filter) for the same reasons. Once a week the humidifier chamber should be soaked in a solution of 1 part white vinegar 3 parts water for approximately 15-20 minutes before rinsing thoroughly with distilled water. Some humidifier chambers are dishwasher safe, but make sure to check your CPAP machine's manual before cleaning in a dishwasher. Humidifier chambers should be replaced every 6 months or as needed. Wash mask daily with warm water and mild, non-fragrant soap or purchase CPAP mask specific wipes and detergents. Rinse with water and allow to air dry on a clean cloth or paper towel out of direct sunlight. Before using mask at night, wash your face thoroughly and don't use facial moisturizers. Facial oils and moisturizers can breakdown the silicone faster. Once a week soak mask in solution of 1 part white vinegar 3 parts water before rinsing in distilled water. Headgear and chinstraps should be washed as needed by hand using warm soapy water, rinsed well, and air dried. Do not place headgear or chinstraps in washing machine or dryer. For replacement schedules of CPAP masks you should check both your manufacturer's recommendations and your insurance allowance. However, for most masks it is recommended that you replace the cushions 1-2 times per month, and the mask every 3-6 months. CPAP tubing should be cleaned weekly in a sink of warm, soapy water, rinsed well, and left to hang-dry out of direct sunlight. You should clean the grey non-disposable filter at least on a weekly basis. You may have to clean it more regularly if you have pets, smoke inside your house, or if your home is especially dusty. Rinse grey filters with water and allow to dry before placing back into your machine. The grey re-usable filters should be replaced when it begins to look worn or after 6 months. Replace disposable white paper filters monthly or more frequently if it appears dingy or dirty. Your CPAP machine itself does not need to be cleaned but you may want to dust it down with a slightly damp cloth as desired. Make your CPAP equipment cleaning part of your morning routine, allowing the equipment ample time to dry during the day. Keep machine and accessories out of direct sunlight to avoid damaging them. Never use bleach to clean accessories. Other machine accessories such as power cords and data cards may need to be replaced due to equipment malfunctions. Place machine on a level surface away from objects such as curtains that may interfere with the air intake. Always use distilled or sterile water when cleaning components. Keep track of when you should order replacement parts for your mask and accessories so that you always get the most out of your therapy. With these simple tips on cleaning and maintaining your CPAP device and accessories, you will assuredly have a much better CPAP therapy experience. And remember, you can always contact us here at The Alaska Sleep Clinic for any of your CPAP needs or questions at 855-AKSLEEP (855-257-5337). If you would like a care and cleaning info graphic handout you can click here.